Prostate health and PSA testing is a hot debate especially in terms of screening, which can cause of lot of anxiety to patients. Cancer Research UK has provided a very useful and explanation tool (2018) which can be accessed by clicking here. 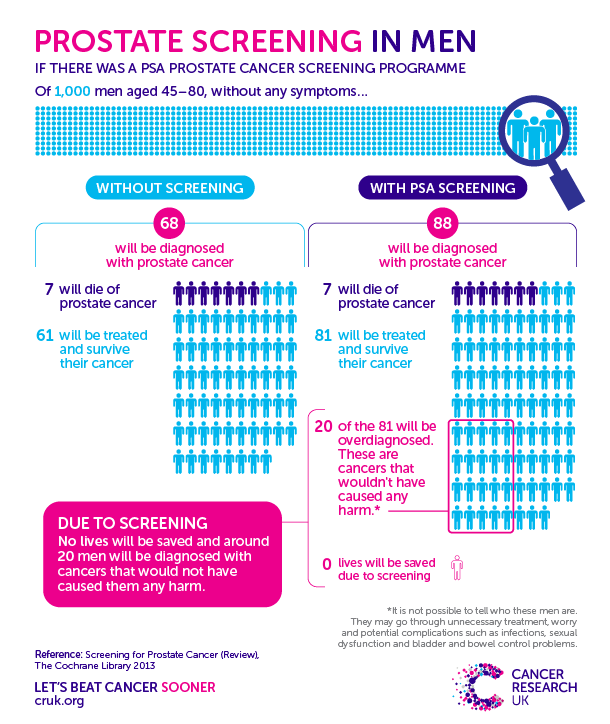 This UK view agrees with US Screening Recommendations 2012 which does not recommend screening for prostate cancer at any age as the benefits of screening for prostate cancer by measuring PSA does not outweigh harms. If despite this advice, you still want to have a PSA test then it is recommended that the test is restricted to men aged from 55 to 69, and that you make an appointment with your GP. If your PSA test is found to be low (2 or less) no further PSA testing is recommended, as your lifetime risk of developing significant prostate cancer is very low and continued testing is more likely to cause you harm. If your PSA is found to be greater than 2, you may benefit from continued screening. For more information, please click here to be directed to the NHS Decision Aid on PSA Testing.